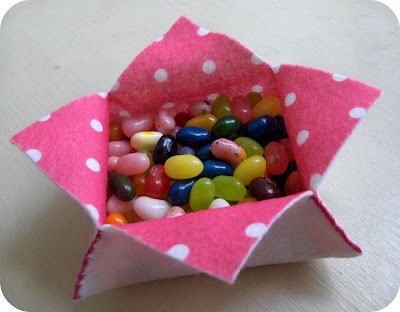 I've seen larger versions of these fabric dishes and decided to give it a try on a smaller scale. This box measures about 5 inches in length. You could make these in any size, really. This might make a nice alternative to the traditional Easter basket. Simple directions below. Felt - I got the polka dot felt at Daiso. Cut out a felt square(7 by 7), any size will work. 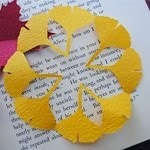 With the print size up mark the center of each side with a fabric pen or by ironing a crease. I folded the square in half both ways and ironed the fold. 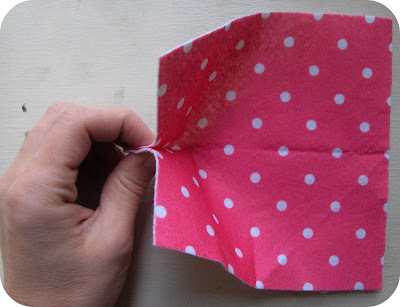 Pinch the fabric together where you marked one of the sides. 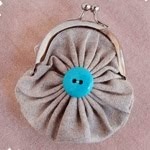 Using a whip stitch, sew up the side one inch in length. 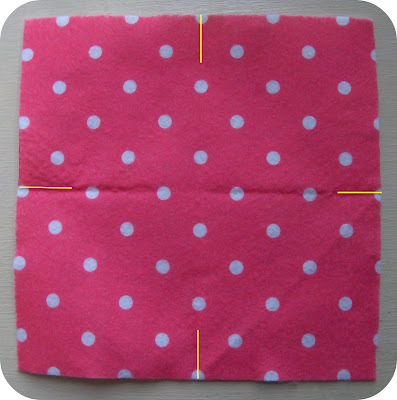 If you started with a larger square you might want to vary the length to two inches. It just depends on how deep you want the dish to be. Here's what it should look like once one side is sewn. Here's a close up of the above picture. 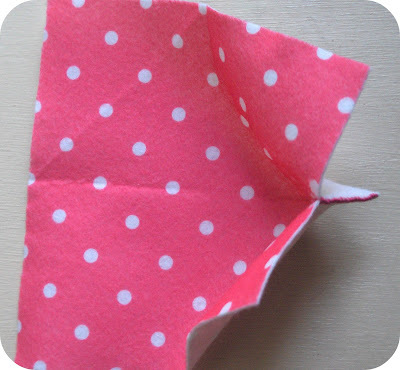 Now sew the other three sides the exact same way. Your felt dish should now look something like this. Enjoy! Of course, I had to buy some candy props for the pictures. I was thinking a square placemat would work well. 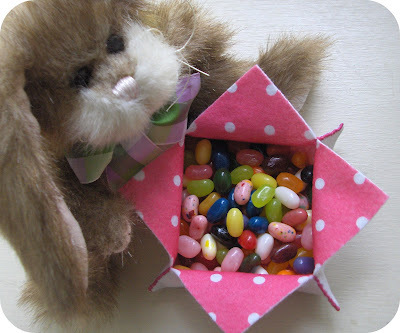 So cute, and for Easter too! Soooo cute! Thanks for sharing. Will be making a couple for sure. You always have the best ideas, Darling!!! I will certainly try this one. 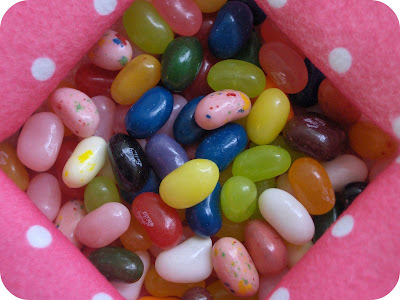 Those jelly beans are making me drool, by the way! YUMMY! I left you a surprise on today's post at my blog! I do hope you check it out, for I think you deserve it!!! This is so cute! I'm going to try it in paper and see if it works as well - thanks for your detailed instructions! 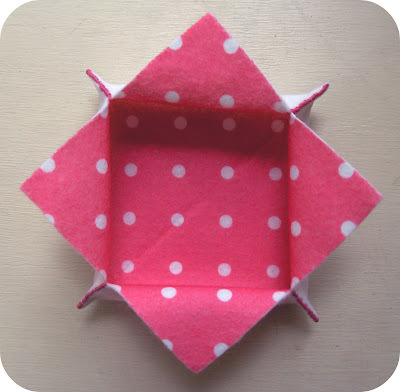 There's a similar origami box like the felt one. It's called a star box. Here's the link with directions if you're interested. 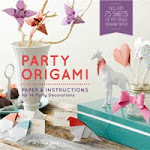 your project is always simple yet very attractive and entertaining! Love it! Just found your blog from a link on ApartmentTherapy.com. I love it! You have so many great ideas! I will be trying many of them, I'm sure. 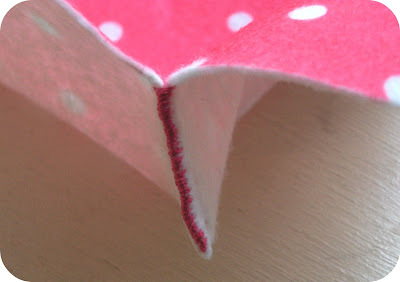 These are great with orphan quilt blocks left over from other projects (http://thequeenbeesbuzz.blogspot.com/search/label/lazy%20angle) -but the felt idea is awesome, too!!! Love the polka dot felt! Even I can do it! Yes! Thank you! Aww, that is so sweet! The colors are darling. I'll be linking...after I got dig up some jelly beans. It's really simple to make but very unique and cute. great fun to make them with the kids. if not, please leave a short message. So clever! Except now I can't stop thinking about Jelly Beans!! !